Forks & Amusement: my kind of comfort food. 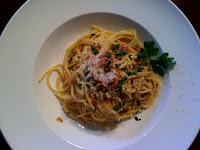 Spaghetti alla Carbonara. Coal Miner's Pasta. One of my ultimate favorites. As you can see, there's a theme going with pasta. I could eat it every night of the week. I've tried so many different carbonara recipes - with cream, without cream, with bacon instead of pancetta, with rigatoni, with spaghetti. Whatever variation you choose, the must-have ingredients for this recipe are: cheese (parmesan, pecorino, or a combination), egg yolks, pork and black pepper. I have to say, I've never met a carbonara I didn't like. My dad's is pretty darn good. But I have found a favorite, courtesy of Tyler Florence. Don't skimp on the cheese to pass and the fresh flat-leaf parsley - in my opinion they're the best parts. Bring a large pot of salted water to a boil, add the pasta and cook for 8 to 10 minutes or until tender yet firm (al dente). Drain the pasta well, reserving 1/2 cup of the starchy cooking water to use in the sauce if you wish. Add the hot, drained spaghetti to the pan and toss for 2 minutes to coat the strands in the bacon fat. Beat the eggs and Parmesan together in a mixing bowl, stirring well to prevent lumps. Remove the pan from the heat and pour the egg/cheese mixture into the pasta, whisking quickly until the eggs thicken, but do not scramble (this is done off the heat to ensure this does not happen.) Thin out the sauce with a bit of the reserved pasta water, until it reaches desired consistency. Season the carbonara with several turns of freshly ground black pepper and taste for salt. Mound the spaghetti carbonara into warm serving bowls and garnish with chopped parsley. Pass more cheese around the table...and get ready to feast.